Home Companies Beijing Hongtech Co., Ltd.
SBA-15-50(without basement) Spray Booth is an advanced type of industrial spray booth which absorbing several technical advantages from domestic and abroad. 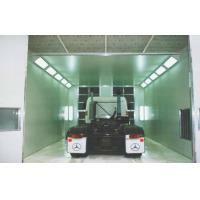 Excellent design and perfect technology make our spray booth more suitable to the market's requirements. The inner dimension 15000X5000X5000mm is very popular in many countries. And it's equipped many parts imported parts, like the Italy Riello burner, Philip lights etc. We can adjust the size according to customer's desires. CE certification guarantees excellently performance, strong practicability, and high economical efficiency. Intake air from side upper direction, exhaust air fromrear side direction, quadrate steel frame, outside is white coatedsteel, inside is galvanized steel. Pre-filter, high efficiency filter(ceiling filter),floor filter(fiberglass), M-shape activated carbon filter, extractfiberglass replaced by level side. Option color: blue, orange and white. Industrial spraying booth, Industrial spray paint booth, Industrial spray booth heating system, Industrial spray bake paint booth, Industrial spray booth paint booth, Industrial baking booth, Industrial paint spray booth, Industrial spray booth water curtain, Industrial cabinet spray booth, automotive industrial spray booths, automotive industrial paint spray booth, Industrial paint spray booth, Industrial spray booth paint booth bake oven, Industrial spray oven bake booth, Industrial spray paint booth oven, Industrial paint spray booth, Industrial infrared spray paint booth, Industrial down draft spray booth, Industrial spray painting drying booth, tan spray booth, garage spray booth.